That's just about all we've got time for this evening. Thanks for joining us, on a night that started perfectly for Blackburn, with a goal inside 17 seconds from Craig Conway, and they never looked back. For Leeds, their wait for a home win continues, while Steve Evans remains winless in his three games as United boss. They are also yet to score a goal from open play under their new manager. Blackburn are up to 14th in the table, while Leeds drop to 18th. You can read more here in Josh Hunt's match report. We'll see you tomorrow for Brentford v QPR. Good night. "When I was at Rotherham, Steve Evans was a good manager. I'm sure he can turns things around here (at Leeds)." "We started on the front foot. It took them by surprise. It was a great start for us. "We have been lacking a bit of luck. Our performances have shown that. Up until now we have been playing quite well, without getting the results." The referee brings the game to a close - mercifully for Leeds - and Blackburn have won an away game for the first time since winning at Elland Road in April last season. Steve Evans' first home game in charge of Leeds has been one to forget for the hosts. Corry Evans is booked for Blackburn in these closing stages. That could be an expensive yellow card for the visitors, as the midfielder will now miss their next game against Birmingham City, on Tuesday. Moments later, Rovers' Craig Conway is booked for dissent too. This is all a tad unnecessary for Blackburn who are about to run out easy winners. Plenty of unhappy Leeds fans out there tonight. This has been comfortable for Blackburn, it really has. Leeds haven't threatened at all since the break and that is what will probably worry the home fans the most. Five minutes of added time have been signalled, mainly due to the lengthy stoppage we saw when Rovers' Grant Hanley suffered a cut on his head. John O'Sullivan replaces Chris Taylor for Blackburn, who look set to earn their third win of the season. Alex Mowatt has a go for Leeds but his effort is deflected wide. It has not been the hosts' night. If it stays like this, Leeds's winless run against Blackburn will extend to eight games - they haven't beaten Rovers since 2004. It would also be a fourth loss in six matches and no victory in the whole of October for the Yorkshire club. Midfielder Alex Mowatt comes on for Leeds, in place of Lewis Cook. Moments later, Leeds' Jordan Botaka jumps well in the box but gets too much on his header and it goes over the bar. Blackburn give Tom Lawrence a rest and bring on Nathan Delfouneso for the closing stages. Mirco Antenucci has a half chance for Leeds but he snatches at a left-footed effort from inside the area and it rolls harmlessly into the arms of Jason Steele. It's been a disappointing showing from the Italian striker so far this evening. There has barely been a whiff of an attempt at a comeback from Leeds. Surely they will put some pressure on Blackburn at some stage in this second half? The Rovers physios confirm that skipper Grant Hanley cannot continue, so Matt Kilgallon comes on for the visitors and takes the captain's armband. They have 11 men on the field again. Leeds midfielder Lewis Cook chips an effort at goal from outside the area but Blackburn's Jason Steele claims it comfortably. Grant Hanley is still being given some stitches somewhere down the tunnel, out of sight. Blackburn will be relieved if they are still two goals to the good when he eventually returns. He's been a rock in the Blackburn defence so far. The Scotland striker bagged his eighth goal of the season after just six minutes. Souleymane Doukara replaces Chris Wood in attack for Leeds. Is that the change the hosts need to get back into this game? For the time being, Blackburn are down to 10 men, as their captain Grant Hanley gets some treatment. Blackburn's Grant Hanley looks hurt and has blood coming from a cut on his forehead after a fairly innocent, but painful, clash of heads with Luke Murphy. A split second before that collision, Chris Wood appeared to lead with his elbow as he challenged for the ball with Rovers' Hope Akpan. That prompted a reaction from several Blackburn players, but the referee calms everyone down. If Leeds are going to earn a first home win of the season, we are in for quite a dramatic finale to this match. But in truth, it is hard to see the hosts scoring at all as things stand. They look bereft of confidence. Blackburn are looking to take the sting out of this game and slow things down when they have the ball. They're doing so successfully at the moment. Plenty of frustration inside Elland Road as we enter the final half hour. Jordan Rhodes frees Tom Lawrence down the right-hand side, and the forward finds Craig Conway in space inside the box. Conway can't get a shot away though. A lucky escape for Leeds. Leeds are having the better of the possession early on in this second half, but there are still no chances to report. Grant Hanley and Shane Duffy are doing a sterling job of sweeping up any long balls forward at the centre of Blackburn's defence. Jordan Botaka comes on in place of Tom Adeyemi for Leeds. The winger will need to make a big impact if the hosts are to pick up their first home win of the season. Neither side have made any changes at the break, but Chris Taylor is down and receiving treatment after taking a kick on the knee from Lewis Cook. There was no malice in the challenge from the Leeds man, and thankfully for Rovers it looks like Taylor is fit to continue for now. The players are out on the pitch and Leeds get us back under way at Elland Road. What can Steve Evans' men do to turn this one around? Blackburn had two shots on target in the first half, both of which resulted in goals. Leeds will need to find much more attacking intent after the break - just the three shots in total for the Yorkshire club. So, after a disastrous start which saw them concede twice inside the first six minutes, Leeds rallied somewhat towards the end of that first-half, but they still have an awful lot of work to do if they are to get anything out of this game. Blackburn will be delighted with their night's work so far. Craig Conway tucked the visitors ahead inside 17 seconds, before Jordan Rhodes capitalised on some sloppy defending to double the lead. Can Leeds conjure up a comeback after the break? Neither side can muster any more chances, and Blackburn can be happy with their first 45 minutes' work. Leeds go off to a chorus of boos from the home fans. Blackburn are seeing a bit more of the ball, but the visitors are content just to pass it around in midfield. There will be two minutes added on at the end of the half. Steve Evans has got a big half-time team talk coming up, that's for sure. Blackburn struggle to clear another Leeds free-kick, and Luke Murphy swings a cross in which Tom Adeyemi glances onto the far post. Rovers will be delighted if they can hold onto their two goal lead until the half-time whistle. Sol Bamba is the first man to go into the referee's book. The centre-half is shown a yellow card for dissent. Leeds are pressing forward here, but Jason Steele has still not really been tested. Stuart Dallas does well to a hook a cross into the box from the right, but Blackburn clear their lines. There's a little bit of afters between Mirco Antenucci and Grant Hanley after Antenucci is fouled by Corry Evans. Leeds win a free-kick midway inside the Blackburn half. The ball eventually finds its way to Mirco Antenucci who volleys into the side-netting at the far post. That's the closest the hosts have come. Steve Evans will be slightly more encouraged now than he was 10 minutes ago, but his side need to find a couple of goals from somewhere. Tom Lawrence is back on the pitch and is okay to continue. Blackburn's Tom Lawrence is receiving treatment after landing awkwardly when challenging for a high ball. Leeds cause havoc in the Rovers box with their first corner of the game. The visitors need three swipes at the ball to get it clear, but once they do, they quickly break away and Ben Marshall has a shot at the other end, but he hits it way over the bar. Blackburn break forward again after a crunching tackle from Tom Adeyemi, and Craig Conway's bouncing cross is almost diverted goalwards by Jordan Rhodes, but he is deemed to be offside anyway. Maybe a quick blast now would help Leeds. Elland Road has gone quiet after those two Blackburn goals in the first six minutes. Flat. That would best describe the pace of this game, with Blackburn two goals to the good. Leeds will want to up the tempo, quickly. Mirco Antenucci is almost in on goal for Leeds but he can't quite reach Sam Byram's long ball. It was a terrific pass, and Rovers keeper Jason Steele comes out to palm it away, and doesn't clear it as cleanly as he would like, but eventually the visitors remove the danger. Leeds striker Chris Wood tries to bring down a long ball and swivel in the box, but he loses control of the ball at the last moment and it trickles harmlessly out of play for a goal kick. Beram Kayal's goal for Brighton against Huddersfield in August also came after 17 seconds. Leeds enjoy their first sustained spell of possession in the game and it leads to their first shot on target. Lewis Cook has a go from range, but his bouncing effort is comfortably saved by Jason Steele. The hosts look vulnerable every time Blackburn venture forward. We shouldn't forget, this is a Rovers side that haven't won away from home yet this season. Leeds keeper Marco Silvestri punches the resulting free-kick clear and Blackburn win a corner, but Leeds eventually get that away too. The hosts are not seeing much of the ball and the home fans are understandably getting more and more frustrated. Chris Sutton scored after just 13 seconds against Everton in the Premier League in 1995, Andrew, so not quite. But still a superb start for Rovers. Rovers winger Craig Conway bursts away down the left flank and wins a free-kick in a dangerous position for the visitors, near the corner flag. Can Leeds pick themselves up after this nightmare start? Chairman Massimo Cellino looks very unhappy, in the stands. Blackburn are knocking the ball around confidently. Blackburn can hardly believe how this game has started. Jordan Rhodes scores his eighth goal of the season and he won't score many easier than that. The Leeds defending was poor, and that is being kind. Tom Lawrence waltzes through the back line and squares for Rhodes, who turns inside the box and slots into the bottom corner. Boos ring out around Elland Road. Well, that was hardly the ideal beginning to Steve Evans' first home game in charge. That goal has completely flattened the mood at Elland Road. It is rather quiet all of a sudden, except for a delighted band of Blackburn fans in the corner. Straight from the kick-off, Blackburn are immediately ahead. It is a horrible start for Steve Evans' side. Sol Bamba makes a hash of trying to head clear a Chris Taylor cross and Craig Conway has time and space at the far post to lash the ball low into the bottom corner. It took all of 17 seconds for the visitors to open the scoring. Blackburn, playing in their red away kit, get things started. The two sides emerge onto the field at Elland Road. Kick-off is coming up next. Eagle-eyed readers will have noticed Mr Evans turns 53 tomorrow...will the Leeds boss have more than his birthday to celebrate after tonight's encounter? Leeds and turmoil...two words that have seemingly gone hand in hand in recent months. The man at the centre of the merry-go-round is chairman Massimo Cellino who launched an appeal on Wednesday against his Football League ban. The Italian was found guilty of an offence under Italian tax legislation relating to the non-payment of VAT in June. However, tonight all the focus will be on the pitch where Leeds need to start picking up some points. 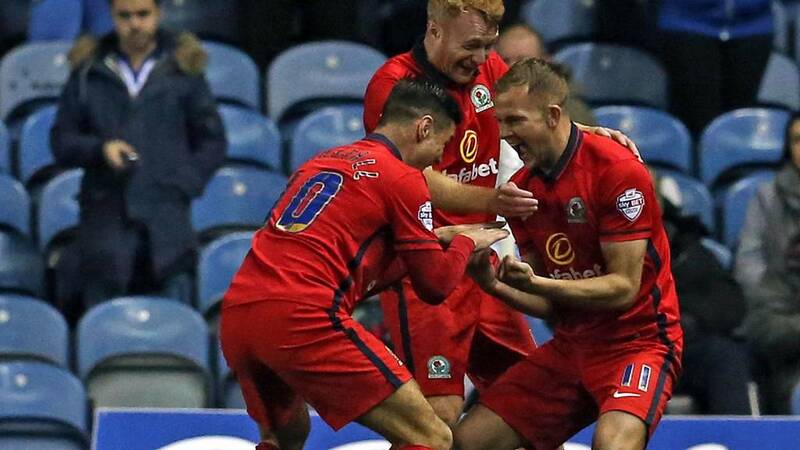 Blackburn's Jordan Rhodes has scored seven of Rovers' 12 goals in the Championship so far this season. Five other players, including Nathan Delfouneso and Craig Conway, have scored one league goal. Can someone else step up for Gary Bowyer's side tonight at Elland Road? Cast your minds back to 1995 Leeds and Blackburn fans...not a bad year was it? Blackburn of course were crowned Premier League champions in May of that year, while Leeds finished fifth in the top flight under Howard Wilkinson. BBC Radio Leeds' Katherine Hannah thinks Jordan Botaka might have got his chance for Leeds this evening. Has Steve Evans chosen the right starting XI after two straight draws? Meanwhile, Blackburn have made one change to the side that lost 1-0 at home to Burnley on Saturday. Chris Taylor comes in for Nathan Delfouneso, who is named among the substitutes. Substitutes: Raya, Henley, Spurr, Kilgallon, Delfouneso, Williamson, O'Sullivan. For the third match in a row since Steve Evans arrived, Leeds have named an unchanged starting XI. Top scorer Chris Wood, who picked up a knock at the weekend, is deemed fit enough to start. Winger Jordan Botaka returns to the bench after struggling with tonsillitis, in the only change to the home side's squad. Substitutes: Horton, Bellusci, Wootton, Mowatt, Buckley, Botaka, Doukara. Who can forget Steve Evans turning up at Elland Road in a sombrero on the last day of the 2013-14 season after securing Rotherham's survival in the Championship? It's an image which will live long in the memory I'm sure! The final day of the season often sees supporters donning fancy dress, so we'd like to know what the best wacky outfit that you've worn on the terraces is? Get in touch on Twitter using #bbcfootball - pictures are also welcome! Both teams have managed just two wins each so far this season, with tonight's hosts Leeds yet to taste victory at home and visitors Blackburn yet to win away. Leeds have won just one of their last eight games, and are without a home win since 4 March - a run of 11 matches. Blackburn have picked up just three points on the road so far in 2014-15 and are without a win on their travels since 4 April. And who did they beat on that day? Yes, you guessed it - tonight's opponents Leeds. Good evening. If you're here for Steve Evans' first home game in charge at Elland Road, you've come to the right place. We can't promise you sombreros, flip flops and shorts - but what we can guarantee is a game that both teams are absolutely desperate to win. At the start of the season, surely only the most pessimistic of Leeds and Blackburn fans would have seen their clubs lying 17th and 18th in the Championship table respectively after 13 games. But that is where they find themselves. Can either side kick-start their season tonight? Stay right here for live coverage of Leeds v Blackburn.